Tom spends his down time bicycling and running trails in the mountains in the Los Angeles area. His work focuses on brain repair after stroke and other brain injuries. In particular, he examines the molecular and cellular events that limit the degree to which a person can recover. Understanding these these process will help them devise ways to stimulate brain repair to lead to greater recovery. Tom remembers being interested in the brain and brain research from early on in middle school and high school. It was fascinating to think of the brain as the organ that led to our humanity. When Tom entered medical school, he initially planned pursue clinical endeavors, but he realized that what really made him happy was discovery. The creative components and excitement of scientific discovery sent him down the research path. Some of Tom’s biggest struggles occurred early on in his lab. When he started, he really wanted a broad understanding of what molecules were active as the brain repaired after stroke. This was a challenge since the methodologies to do this were just evolving at that point. It took 2-3 years, as well as many failures and iterative improvements, to develop the new techniques and technologies required, and the stakes were high since he didn’t have other projects in the works to fall back on. Through his interdisciplinary research, Tom has been able to bring together various investigators, including bioengineers, stem cell biologists, neurosurgeons, and pharmacologists, to collaborate on different aspects of brain repair. It has been a rewarding success to write grant applications and publications with these collaborators. Tom had the opportunity to travel Kananaskis in Alberta, Canada for a neural repair conference. The meeting took place in the winter, and this area was where some of the Winter Olympic Games were held. The scenery was beautiful, and he was able to enjoy some excellent skiing and snow walks while he was there. When Tom was a graduate student, there were a handful of very respected faculty members used to get together and have what was essentially a jug band. They would get together to play banjo, fiddle, and guitar while the graduate students and post docs hung out and listened to the music. This was a fun experience and hilarious to see their distinguished elderly mentors jamming away in the band. Try to enjoy and take advantage of the ups and the downs in science because there will be a lot of both. Tom currently has active laboratory and clinical interests in stroke and neurorehabilitation and how the brain repairs from injury. Dr. Carmichael’s laboratory studies the molecular and cellular mechanisms of neural repair after stroke and other forms of brain injury. This research focuses on the processes of axonal sprouting and neural stem cell and progenitor responses after stroke, and on neural stem cell transplantation. 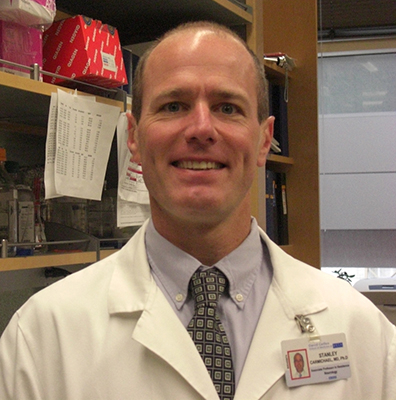 Dr. Carmichael is an attending physician on the Neurorehabilitation and Stroke clinical services at UCLA.